Last week, nearly half of us chairs loaded up the cars, and headed east to Houston for the very first Texas Marketing Summit. The summit featured some world-class brands, some fabulously knowledgeable panelists, and one of the greatest buffets in hotel history. For us, it represented a proverbial microcosm of the very business we’re in, the context of which consists of: 1) a target audience with a need, 2) media, and 3) competitors/clutter. We thought it was the perfect opportunity to flex our right brains and make a splash in an environment where everyone else was trying to do the same thing. We brainstormed for a couple of weeks prior to the summit in search of a breakthrough idea. The theory went that all of the other sponsors/vendors would fill their booths with the usual boring pens and stress balls—they did—leaving an opportunity to do something a little more memorable. A month or so before the summit, we had our idea: “One Hour Ads.” In lieu of a traditional booth, our team would set up a green screen backdrop, bring improv actors, and then film and edit a video spot for any brand who wanted one. All in an hour. One. Hour. Ads. All-in-all, the day itself went extremely well. We think it may have had something to do with Tilted Chair being the summit’s first sponsor—thanks, Will—but we found ourselves situated right next to the buffet line. We also had about double the booth space of any other sponsors, which was nice. Space and location, two commodities that are like gold at a conference like this. We kicked things off at 8am, and took turns attending panels/manning the booth throughout the day. 10 hours later, we’d made eleven spots—should we have named it 55 minute ads? Nah—some amazing new contacts, and had an absolute blast. Here are the three things we learned while rocking the summit. When expressing a new idea, clarity of intention is of the utmost importance. We thought “One Hour Ads” was pretty simple and self-explanatory, but it became abundantly clear early on that we needed to adjust our pitch to attendees. Several booth visitors thought we were debuting a new concept for a creative agency, in which one hour ads was all we did. A new agency model, of sorts. Hmmm. Interesting idea, but not what we were shooting for. As a full service creative advertising agency, our approach lacked clarity. Easy fix, though. The new pitch went something like this: “We’re a full service creative agency. Today only, we’re offering one hour ads.” Voila! Attendees finally got it, and our unique hook was anchored in something clear and intelligible. Clarity achieved. 2. YOU DO YOU. NOT EVERYONE WILL GET IT, AND THAT’S OKAY. One hour ads wasn’t for everyone. It certainly wasn’t for our neighboring booth, but maybe that was just the endless looping bumper music. Of the several hundred attendees and who-knows-how-many companies represented, we were approached by 11 to make ads. Might seem like a paltry conversion rate, but every one of those 11 contacts represented a meaningful impression. We talked. We laughed. And perhaps more importantly, they got a little taste of the Tilted Chair flavor of creativity. 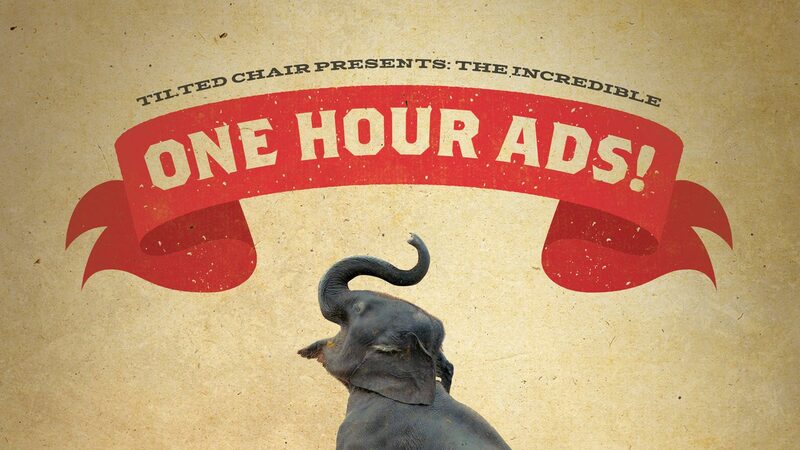 “One Hour Ads” was truly an expression of Tilted Chair thinking and culture. Those potential clients who didn’t “get it” wouldn’t be a good fit for Tilted Chair, and vice versa. On the other hand, those who were willing to take a risk and laugh with us got it. As a culture match filter, “One Hour Ads” worked beautifully. 3. GET PEOPLE TALKING ABOUT THEMSELVES. The greatest conversationalists ask questions, and get people talking about themselves. It’s easy to forget, but every one of the world’s most ubiquitous and popular brands is nothing but an organization of people. People love to talk about themselves—their lives, their struggles, their hopes. Businesses are no different. Our exploratory questionnaire for “One Hour Ads” asked a simple question, “What is your biggest marketing challenge?” That was it. That was enough to get people talking about themselves, their businesses, and their challenges. We took it from there. There were probably other lessons to be learned, but these were certainly the most memorable. Whether we add clients to the roster based solely on this adventure remains to be seen—my guess is, we will, ;)—but that’s not even really the point. We learned a lot from the whole experience, and that alone was worth the cost of entry.